Foxes and the devastation they can cause. Running a farm, there are always ups and downs and what keeps us going is focusing on the good things that happen; new additions to the farm, fruit harvests, new buildings (you get the idea)! What we cannot stand is waste … senseless waste due to excess. Sadly, this post is about the only wild animal we have no respect for … the fox. An introduced species, while beautiful to look at and clever to boot, if this little critter behaved more like a hungry animal than a rabid human … the farming world would be a happier place. If you are queasy … please do not read on as there is an image of the outcome at the end. It is unfortunate for us, that a fox (or more than one for that matter) managed to get into our breeding chicken coup and decimated the entire flock! This is what angers us! We’re OK with the local wedge tailed eagle pair that occasionally take a chook, they only ever take one and we’ll admit look majestic doing it. We’re OK with the occasional fruit bat nibbling at some of the apples, its usually only the top tree fruit they take. We’re even OK with occasionally having to loose a bed of tomatoes to fruit flies if it has been a particularly wet and humid year. Them’s the breaks. But when an animal like a fox gets access to chickens … nothing short of hell breaking loose is the best description of the aftermath. We found 31 beautiful birds scattered and dead one morning. It was heart breaking. 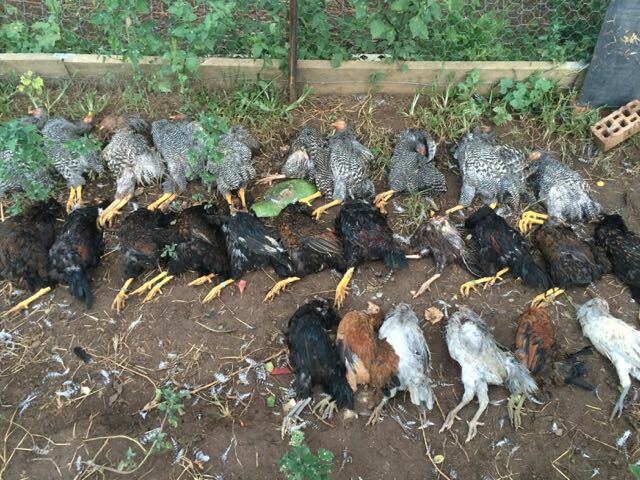 All those friendly chooks and roosters senselessly killed. Necks snapped and left intact for most too. We don’t like to write about the sad things that happen around here, but sometimes we need to remember them to ensure we learn from them. One thing is for certain, we have finally invested in a trap and we’re looking into getting a dog or two from the local animal shelter sooner rather than later. We can definitely say that electrified chicken fences work wonders. Also having a wire skirt or mesh around a fence also stops foxes from digging, but NEVER let anyone tell you that a pen is fox proof at 1.8m (6 foot) because the little blighters can still climb over if they put their mind to it!!! Rest in peace our little flock. We’re sorry that we couldn’t keep you safe. (Not all animals are pictured as their carcasses were not in a condition we believed people would be comfortable viewing). The last couple of weeks, we have been planning and building our next phase in on farm equipment … our Joel Salatin style Chicken Tractors! We have owned chickens for many years and the eggs produced by home flocks are far superior to store bought ones. So our challenge has been to find a way to provide fresh pasture, insects and quality feed to a commercial number of chickens with a low carbon footprint and a superior predator protection. A pretty hefty list of requirements by any standard! A few years ago, we fell in love with Joel Salatin and his farming methods. Since then, we have been visiting other farms nearby who have been trying to take the same problems as us. By far, most have adopted Joel’s methods too. So this month, our target was to build our first pastured poultry run … and so far, it’s a resounding success! Based on Joel’s book, we created a series of panels that we joined together to make a pen. Let me describe it in photo’s for you. After creating a rough drawing, we set to work measuring, cutting and painting the timber. We decided to paint it to involve the kids and also protect the timber from the elements. Next, we created a series of frames and double covered them in wire mesh, leaving a long skirt hanging off the external frames as fox protection. In the past, the foxes here have managed to pull wire off to get to our birds and also dig under our fences, hence the skirt. We used 1800 bird wire, doubled over and tacked every 15cm. If a fox is determined enough to get through that … then he can take all the birds he wants. Next we connected all the frames together and built the doors. Because it is very hot here, we decided to provide a larger connected shade area for our chickens. This is why half the door is covered in ours rather than having one fully covered and the other just mesh as per Joel’s design. The bird mesh provided great friction in keeping the doors in place. We then connected a rope and pipe as a handle at the front and used our trusty hardware trolley as the fulcrum at the back. Here it is in situ, awaiting the new girls. We peg the skirt down at the edges for extra security. We will keep you posted on how it works out! Now just to build a few more for the meat birds! Too many roosters mean numerous weekend roasts. When you hatch your own chickens, you get a roughly 50/50 ratio of males to females … so what do we do with all our roosters? We grow them on and then turn them into a weekend roast! As is the way with living on our farm, we let these boys grow up alongside their sisters, but when puberty kicks in and they start to fight, then we intervene by scheduling their booking at out kitchen table. Before we select our bird(s), we ensure that we have a clean table and board to cut on, sharp knives for butchering, a bucket for plucked feathers and entrails and plenty of hot water (in a tub preferably) to assist with plucking. We do not take the decision to slaughter our birds lightly. While our roosters are not pets, we have still grown them from little chicks, so we make sure that they are relaxed and comfortable beforehand. As all our birds are accustomed to being handled, they think nothing of being caught and carried away. Once we have collected our bird, we tie up his feet and then place an old sock over his head. Once he relaxes, we lay him down and remove his head. We hold him as still as possible at this point until he relaxes and then start to clean him up. They are very big birds, as you can see by comparing the bird size to the paring knife in the image above. The meat from this chicken (Plymouth Rock), is much darker than what you find in the supermarket. It is more red than white and has a layer of chicken fat on it that makes for an amazing flavour when cooked. It is a heritage breed chicken and was actually bred to be used as a dual purpose bird … for both meat bird and egg production. This carcass dressed up to 2.1kg for your reference and was a 23 week old rooster. Much older (and larger) than store bought meat chickens which are usually around 8-10 weeks old. At least these birds had a longer life than most of their counterparts. NB: The birds we slaughter are for our own consumption only. These are not for sale to the public. When our meat birds are available for purchase, they will be managed through a local poultry processing plant nearby. Have you ever taken the time to think about the humble egg? It is a naturally packaged bundle of deliciousness that gets laid by a chicken nearly every day of its short life. From the time that a chicken hatches, depending on the breed, it takes anywhere from 18 weeks to 32 weeks to lay its first egg. So on average, your humble chicken starts laying at around 5 – 6 months of age. Once they start laying, they produce eggs nearly every day for around 8 months, then their bodies take a break (wouldn’t you?). Given the people population (not chicken population! ), most eggs that we consume, are laid by girls that are between 5 and 18 months old. After this, they are replaced by most egg farmers with a new batch of birds. The “old” birds are then processed into many of the foods we eat (e.g. nuggets). This is egg production on an industrial scale. The chickens we hatched at the end of August are now starting to lay their first eggs. As a chicken starts laying, they usually lay tiny eggs, starting with ones that only have a yolk. In the image below, you can see a pale blue egg which is tiny compared to a “normal” sized egg. This little one was layer today by one of our Araucana girls. The blue colouring will become more prominent in the next few weeks. As their body gets more accustomed to laying, they get bigger but are still smaller than your “normal” egg. There are two slightly smaller eggs in the image below that were laid by a Plymouth Rock girl that started laying last week. Finally, after about 4-6 weeks, the eggs are more “normal” in size. The two pictured were laid by different breeds. The light one by our Plymouth Rocks and the Brown ones are laid by our Barnevelders. No blue or green shelled eggs ATM as our hens are sitting on the next clutch of eggs. So, the next time you use an egg, have a thought about how long it took to get to your table. Also, think about how that chook has been treated. Our eggs will be on sale at the end of January.